I want to congratulate our Noah´s, Spellbound Forgetmenot Santana, granddad, the outstanding Ketil, Tylko Ty Viking´s Pride of his superb wins in Donaueschingen-10, Germany, one of the Europes biggest (if maybe the biggest) Sighthound Special Shows! On first day of the show Ketil was BOB under judge Bo Bengston, Bohem whippets, USA!!! 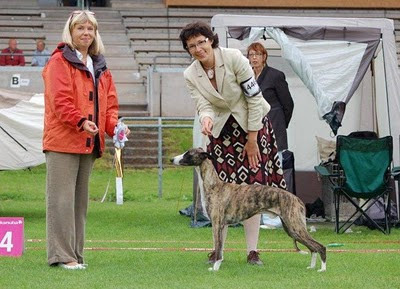 On second day Ketil took BOS, judge Ingela Kyrklund, Colt´s whippets, Sweden!!! Monumental compliments to Ketil´s breeder and co-owner, who is also Noah´s co-owner, Justyna Szopa, knl Tylko Ty and Ketil´s owner/handler Anna Skowronska-Kociecka, knl Karadhras!